Sweet heat defines this snappy meal. 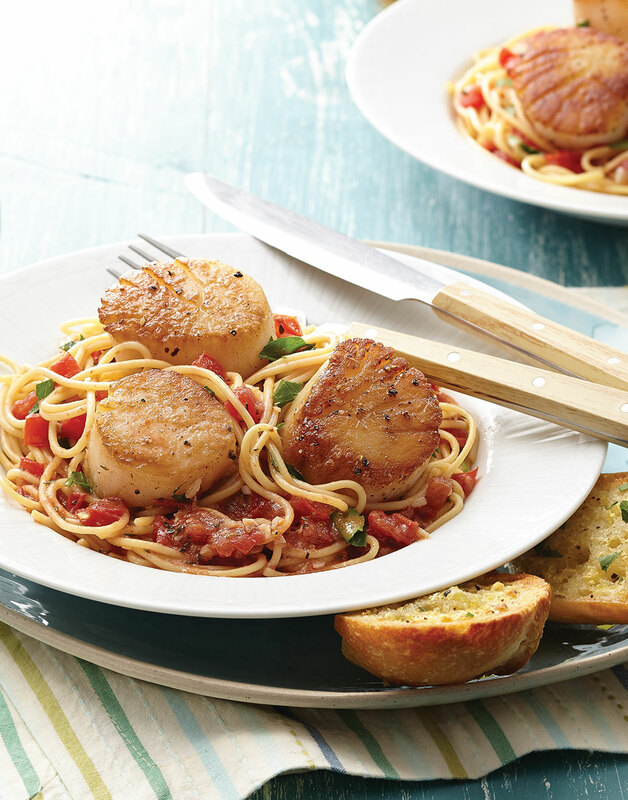 Scallops and tomatoes combine to create a savory dish with a kick. Cook spaghetti in a pot of boiling salted water according to package directions; drain and reserve 1/2 cup pasta water. Sear scallops in 2 Tbsp. oil in a sauté pan over medium-high heat until golden on both sides, 3–4 minutes per side. Transfer scallops to a plate and tent with foil to keep warm. Sauté garlic, thyme, and pepper flakes in remaining 2 Tbsp. oil just until fragrant, 30 seconds. Add tomatoes, wine, lemon juice, and any scallop juices on plate to pan; bring to a simmer. Add spaghetti and bring sauce to a simmer just to heat through, adding pasta water until it reaches desired consistency; toss with parsley and serve with scallops. So the sauce doesn’t get watery, cut out and discard the seeds and chambers of the Roma tomatoes. To get the best sear on the scallops, pat them dry with paper towels. Season them just before searing. Searing the scallops develops fond in the pan, which is the base for the flavorful sauce.